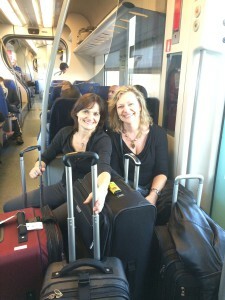 ← In the mouth of the monster. . . .
Linda and Barbara on the metro train from the Rome airport to the Main Train Station at the historic Center of Rome. Jet-lagged and excited to start our first retreat! My traveling shoes are ready! Looking at photos from our February 2015 retreat, I remember our anticipation and excitement when we arrived in Rome. The kindness of strangers provided this photo of us surrounded by our supplies for the retreat. We are heading back in May 2016 for two seven-day retreats in Italy and I can’t wait. We are approximately a third full at both retreats. With only six private rooms with ‘en suite’ bathrooms, it is easy to fill up. Two rooms have two beds so our maximum is eight guests if close friends or family members book together. Now I’m thinking of visiting gardens in Andalusia, Spain, to scout unique experiences for our retreats. Will these gardens provide a powerful experience for The Quiet Garden? World class gardens and guided art meditation inspired by the metaphors of the garden spaces. With roots in the 8th century, the early gardens of Spain reflect the science, geometry and order of Persian gardens – mirrors of Paradise. Designed with symbolic use of water, perfumed scents, cool shade and courtyard seclusion in the dry heat. I’ll keep you updated!